Brandywine Creek Hot Springs – what do we know about them. Do Brandywine Creek Hot Springs even exist? Maybe. The information from various sources (albeit, not very current) shows us that they do. However, there is not a single trip report or a blog mention that I could find (besides for one unsuccessful attempt). Which seems odd in this day and age; especially given the proximity to the city, and knowing the exploratory lust of local hikers. First time I learned about the Brandywine Hot Springs (which, by the way, is not an official name, as the hot spring is unnamed) is from the list of 25 hidden hot springs in BC. Since the time I read the article I couldn’t sleep, and when I could I woke up in the middle of the night to stare at the ceiling. It was bothering me so much to know that there is a hot spring that close to the city, that even the famous Glen Woodsworth (the author of the hot spring aficionados’ bible “Hot Springs of Western Canada“) hasn’t been to. The first, and probably, the most apparent and easy-to-find search results about this hot spring were the list I mentioned above and the Wikipedia article. Neither really provided any information to help find the hot spring, besides mentioning that “there is an unnamed hot spring that sits in the upper reaches of the creek bed, near Mount Fee“. I started a thread on the Vancouver Hiking subreddit. Nobody could confirm the exact location of the hot spring. But the suggestions from like-minded people started rolling in. There are hot-springs on Shovelnose and Turbid Creeks, south of Mount Cayley, and on Brandywine Creek, east of Mount Fee. The feeder system for the former two springs runs in a north-easterly direction, west of the park boundary. From this Government study (the map is on page 16) i_like_rocks cropped and circled Figure 2 to show a possible location of the hotsprings. “The hatched unit is the Mount Fee complex, which seems to be mentioned as a likely location for geothermal activity”. Ok, so now I know that the hot spring is somewhere to the East of Mt Fee. There are two known roads that go up there, Chance Creek FSR that mattfromtelevision mentions, and another road that starts on the west end of McGuire road. The person who did the attempt I mention in the beginning of the post uploaded the GPS route (starting from McGuire Rd.) from their attempt, and they show the location of the Brandywine borehole (the blue mark). 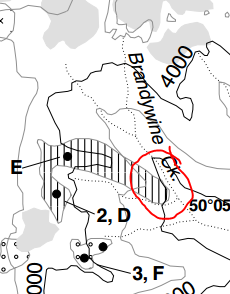 In their blog post there are mentions of two other hot springs and two boreholes in the area with unknown locations (I assume that these are the Shovelnose and Turbid Creeks in the Callaghan Valley that I referenced above). But going up there unassisted feels like a suicide mission, so I just need to find someone with a GPS and a dual-sport bike in their possession. This is probably the most comprehensive book that covers the most known and the best hidden hot springs in British Columbia. You can learn about the location, the water temperature and the history of hot springs in our province.